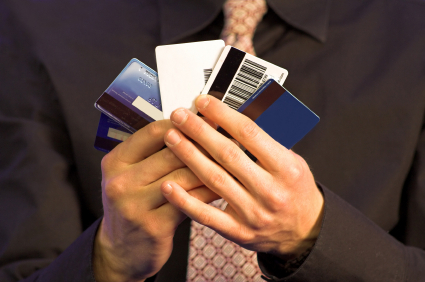 Which Credit Card for ‘Free’ Air Trips? Your choice of card depends on how you earn the credit and how you prefer to use it. Overall, your most important choice is between cards that earn credit in airline frequent-flyer programs and cards that earn credit—whether it’s called “miles” or points—in bank programs. Next, you have to look at your own travel patterns. Let’s look at a few scenarios. Occasional Traveler: You’re in this group if (1) you don’t fly enough to play the frequent-flyer game seriously, (2) you spread your business around among different lines, and (3) you want to use credit toward air trips in coach/economy. My recommendation is that you forget about cards that earn airline miles and instead concentrate on one of the bank programs. The best of those return either the equivalent of 2 percent on every dollar you charge to the card or variable returns of 1 percent to 5 percent depending on where you charge, sometimes a rotating series of categories such as drugstores, gas stations, crockery stores, and such. You use the cash value—typically one cent per point or mile, and maybe a bit more—to “buy” travel on any airline, at any time. This avoids the hassle of trying to score hard-to-get frequent-flyer seats at the lower award levels. Nerdwallet likes Barclaycard Arrival World MasterCard, which earns two miles per dollar spent on anything and also returns 10 percent of the miles you use for travel purchases ($89 fee, waived first year; 40,000 mile bonus for spending $3,000 in first 90 days). NextAdvisor also likes the Barclaycard in addition to the Capital One Venture Rewards card, also a 2 percent earner, and the BankAmerica Cash Rewards card, AmEx Blue Cash Preferred Card, and several others with variable rewards of 1 percent to 6 percent and annual fees of less than $100. Churn ’em. Several card authorities urge you to “churn” your card accounts, moving around each year, to take advantage of the one-time 20,000 to 40,000 point “enrollment” bonuses many offer. Airline Loyalist: You’re in this group if you fly one airline at least two round-trips a year—and it flies where you want to take your award trips. Use that airline’s cobranded card. Typically, these cards carry an annual fee of up to $100 per year, often waived the first year. American, Delta, and United-base cards include a no-charge checked bag on each trip plus other benefits, and other lines’ cards offer various benefits. American, Delta, and United also offer more expensive cards (with annual fees of around $400 to $500) that add membership in the airline’s lounge club system. But for Delta miles, MileCards concludes that, based on typical spending patterns, the AmEx EveryDay Preferred card generates more Delta miles per dollar than Delta’s own card. Comfort Seeker: If you prefer to use credit to fly comfortably in business or first class, airline programs are your only feasible option. Premium-cabin ticket prices are so high that the cash-equivalent bank-buy model doesn’t work at all. Starwood Preferred Guest AmEx cards allow you to transfer points into miles at a bunch of airlines, including Alaska, American, Delta, and several foreign lines, at a one-to-one rate, with a 25 percent bonus for transfers of 20,000 miles or more. With the bonus, this card earns more miles per dollar charged than the airlines’ own cards. Miles you earn on the Alaska Airlines Visa card can be used for award travel on American, Delta, and a handful of international partner lines as well as on Alaska—although Alaska’s partnership with Delta is a bit iffy these days. AmEx Platinum card ($450 a year) allows one-to-one point transfers to Delta, Air Canada, and a bunch of foreign lines, plus access to the Priority Pass worldwide network of airport lounges. Most airline-oriented cards no longer add the annoying 3 percent surcharge on foreign transactions, and many already have chips. Also, you can consider other hotel cards, which can be generous with award accommodations, but that’s a story for another time. Has Frequent-Flyer Award Seat Availability Improved?